Westway Coaches provide hospitality coach hire without compromise to ensure clients in London and the surrounding Home Counties can enjoy the ultimate travel experience in comfort, style and with the latest available technology. Our hospitality charter gives clients the opportunity to travel in first-class comfort using our somewhat decadent coach fleet. Today’s most modern and stylish vehicles are used to provide luxury coach hire and hospitality services that surpass customer expectations. The interior design inside our coaches is best described as sumptuous and sophisticated. Exceptional on-board facilities guarantee a relaxed, comfortable and stylish journey. 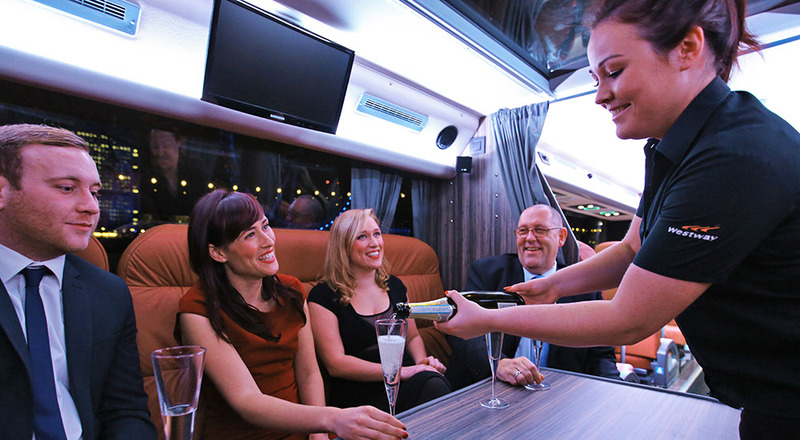 Ideal for corporate coach hire requirements, our hospitality services are currently unrivaled in the London and the rest of the United Kingdom. Clients from in and around London have multiple internal configurations available. This enables them to have a series of customised hospitality coach hire solutions to choose from, which are built around a combination of group sizes and personal requirements. Options are available for rear lounges, central galley areas, tabled seating and non-tabled seating. Our luxury coach hire services are fully customisable to ensure you and your guests never travel in anything less than perfect comfort. Hostess facilities can be provided with hot drinks, cold drinks and catering included. Customers' needs vary, and we are fully adaptable and offer a full and unique service tailored to you and your parties requirements. The Royal Wedding 2018 - transported all private guests to and from the wedding. World Athletics 2017 – 25 coaches supplied for 15 days, transporting athletes and officials during the games from all over the world. New Year Days parade – 20 coaches transporting participants from American universities, London sightseeing trips and transportation for the parade. Transport for the Royal Wedding 2011– transported all private guests to and from the wedding.